This was a time of great change in the United States of America. They had been their own country for less than a hundred years, yet their country and its population had changed dramatically. The United States had been self-governing long enough for its people to begin crying out for change. In a country that was the land of the free and where all men were equal, many were not free and only a few were treated equally. Equal freedoms and rights for Native Americans, women, and African Americans required change from the every citizen, legislation, and the government. Chief Seattle was the chief of the Duwamish and Suquamish Native American of the North West. Chief Seattle signed a treaty in 1854, yielding his tribes land to the Governor of Washington Territory, Issac Stevens, but only after giving the speech "This Sacred Soil." "My people resemble the scattering trees of a storm swept plain." "We are part of the earth and the earth is part of us." "At night when the streets of your cities and villages are silent and you think them deserted, they will throng with returning hosts that once filled and still love this beautiful land." "The white man will never be alone." "A few more hours, a few more winters, and none of the children of the great tribes that once lived on this earth, or roamed in small bands in the woods, will be left to mourn the graves of the people once as powerful and hopeful as yours." As more and more women were joining the work force and joining in the discussion of liberties and rights, it became apparent that half of the population had no representation. 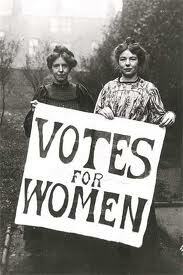 Women did not have the right to vote. They argued that this offense was enough of a reason for men to fight for their freedom from the crown. They then fought with conventions, parades, and banners for their right to represent themselves. - 1848: 1st Women’s Rights Convention in Seneca Falls, NY. - Activist Sojourner Truth delivered a speech entitled "Ain't I a Woman?" at the 1851 Women's Rights Convention in Akron, Ohio. - One famous line stated, "If the first woman God ever made was strong enough to turn the world upside down all alone, these women together ought to be able to turn it back, and get it right side up again!" Harriet Hanson Robinson describes what it was like to be a factory girl at Lowell Mill. She describes the hours, housing, and pay. She also sheds light on the social aspects of factory girls as she writes about The Lowell Offering, a paper that she and other factory girls contributed to during their spare time. But perhaps what is most note worthy about this particular piece is her description of the first strike at Lowell Mill. In October, 1836, the girls of the Lowell Mill walked out in protest of their wages being cut. In this direct application of Henry David Thoreau's ideas, the girls used civil disobedience in order to protest against wage decreases. 12-15 hundred girls walked out, in procession to hear incendiary speeches, some even spoken by women. Harriet Hanson Robinson shares the elation and power that she felt when she lead the other workers on her floor to walk out. She states that, "As I looked back at the long line that followed me, I was more proud that I have ever been since at any success i may have achieved, and more proud than I shall ever be again until my own beloved State gives to its women citizens the right of suffrage" (233). Harriet Beecher Stowe's novel, Uncle Tom's Cabin, helped spur on the abolitionist movement and the Civil War. When she was introduced to President Lincoln at the White House, he declared, "So you're the little woman who wrote the book that made this great war!" (qtd. in 259). Beecher Stowe had a devotedly religious childhood and was influenced by stories of slavery, told to her by her aunt Mary Hubbard. Her aunt had been married to an English plantation owner in Jamaica, but she left him because she couldn't stand the inhumane treatment of slaves. These tales of cruelty, as well as stories of the underground railroad inspired her to write Uncle Tom's Cabin. Uncle Tom's Cabin inspired all those who read it to take a side over the issue of slavery. She focused on portraying African Americans as being human, with spiritual souls and emotions. This was not a common view at a time where slave owners viewed their slaves as animals, and traded their slaves without any consideration of the ability of slaves to form bonds between parents and children, husbands and wives, or friends. 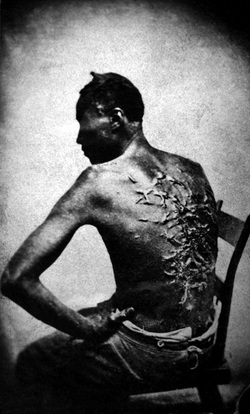 Slave and plantation owners believed African Americans to be a degraded species of humans, who were incapable of having the same feelings and emotions as Caucasians. Uncle Tom's Cabin represented African Americans as people with feelings and souls. Her goal was to show slaves as people. As we will find when we read The Narrative of Frederick Douglas, both slave holders and abolitionists claim to have religion on their side. Rather than getting bogged down in doctrinal arguments, Harriet Beecher Stowe focused on portraying African Americans as individuals with souls who could be just as christian as Caucasians. Uncle Tom is a devout christian who was morally and ethically honorable even in the face of persecution. From a Biblical standpoint, Uncle Tom is very much like Joseph, who was an honorable slave in Egypt who was entrusted with great responsibility. Uncle Tom is trusted with the most responsibility, and therefore he has the greatest opportunity to escape; but his obligations to his master and fellow slaves kept him from running away. Uncle Tom chose not to run away with Eliza because he knew that the other slaves would be punished for his actions. Uncle Tom's Cabin showed African Americans as people. Harriet Beecher Stowe's resounding argument is that slaves suffer just as much as free men, and therefore anything that is considered to be a mistreatment of a white is also a mistreatment of blacks. Sojourner Truth was born a slave in New York state and was named Isabella. 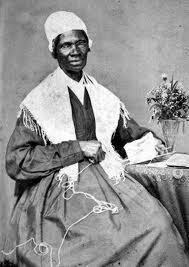 She was freed under the New York State Emancipation Act and adopted the name Sojourner Truth at the age of 46. She then stopped working as a domestic and spent the next 30 years traveling around the United States speaking for feminist and abolitionist causes. Sojourner Truth was never taught to read or write, yet she spoke with authority and wit. Her arguments, as shown in her speech "Ain't I a Woman," are strong and logical. As she traveled she gathered respect as a public speaker for the social movements of the time. Women's rights was an unpopular cause among men and the conventions and meetings were often dominated by male speakers who would attack women's rights rather than support it. Truth was known to get up and disagree with arguments, and this speech is one of those instances. July, 1863: The Battle of Gettysburg was fought. It was one of the bloodiest battles of the Civil War, but this decisive battle turned the tide in favor of the Union Army. In this battle, General Meade of the Union Army defeated General Robert E. Lee of the Confederate army. Between 47-50,000 soldiers died in the battle. The carnage was so great that when President Lincoln came to dedicate the cemetery four months later, horse carcasses still littered the battlefield. 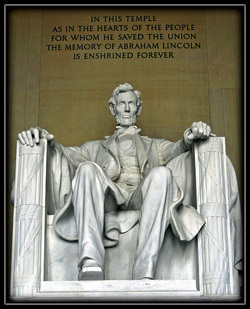 November 19, 1863: President Abraham Lincoln faced perhaps the greatest crisis the United States has ever gone through. He developed into one of the greatest leaders in American history, starting as a small town lawyer and developing into a statesman and military strategist. He rose to be the leader that would reunite the fractured country and lead both sides into a reconstructive peace. Perhaps one of the greatest examples of his leadership is the Gettysburg Address. He only spoke for two minutes, but his words honored the sacrifice of all soldiers who gave their lives for their country while. In this speech, he expressed how deeply he grieved over the conflict between the North and the South, yet he was still deeply committed to a better future for all Americans.